This is an open letter addressed to unemployment. It’s my way of giving an expression to my thoughts (and anxieties) on unemployment. If you can relate to the contents of the letter, you’ll know that ‘you’re not alone‘ & I shall know the same as well. Why are you such a drag? Why won’t you budge your stubborn self out of my way and away from my life? I don’t mean to be harsh with you, I’m only trying to be honest with you. Ever since you announced your presence in my life, all I’m left with is harsh realities of life! My mind has become a factory that produces only thoughts that has you and only you as the central theme. Whenever I gather the courage to go out in public, you clung tightly by my side. Even the unintentional and quite innocent gaze thrown towards me will make me regret my existence at that point in time! You ask me why I make such a fuss about you being here in my life? You say, it’s only for a while, may be for a little longer, in any case not at all a permanent thing! In my defense, you have made me bother about you because you make me bother about myself. You make me feel as if everything is my fault. You make me think, may be some of those people are right, those who say I am not quite active or skilled enough for a job. And, may be I’m those things, but is there nothing more to me than my flaws? See what you do to me? You make me doubt myself and you make me feel weak in the knees! I can’t stand on my own two feet with weak knees. Can I? So, you have got to budge out of my way and away from my life. You do understand, my dear old friend! Let us part our ways on a learning curve on the road in this journey of life. And let us never be bitter with each other for we have known each other too well for too long. 💬 Can you relate to the feelings expressed in this open letter about being unemployed, if you are or ever was in the unemployment line? Also, I won’t at all mind if you think this letter idea is weird! Unemployment is so tough when it drags on, testing one’s philosophical outlook and sense of identity. I can see how you feel. But these are transitory phases in life. Like everything else, this time will also pass. Yes, even I tell myself the same thing. It gets me down sometimes, but that’s okay. We all feel that way in life now & then. I enjoyed reading that. Unemployment is a major issue in my life too and I have been blogging about it and exploring methods to improve my prospects. Hang in there and I hope things change for you. Thank you for reading the post & sharing your thought. Highly appreciate it. Blogging about unemployment has actually changed my life & my unemployment status to some extent. Yes…you are always more than your flaws and sooner or later world will have to acknowledge it too. This letter idea isn’t weird at all. You’re simply voicing what and how unemployment makes you feel. And after long periods of unemployment, one does get those feelings and then some. It’s hard and it’s so easy for others to state, “it won’t last forever” and perhaps it’s true, but the right now is stronger than the future and it’s only normal to feel this type of way. I’ve been rocking on the same boat for a while. And no matter how much you try, rejection replies do start to sting. But one must continue until they finally are welcomed in the place they ought to be. Thank you so much for sharing your thought & for those kind words. To hear about other’s thoughts & experiences that are close to one’s own, is such a wonderful thing. I hope you & I both soon be welcomed in the place we ought to be. Thank you so much Elber for sharing your thought. I’m happy to know you related to what I wrote in the letter. I wish for you to get out of what you rightly called ‘a tight tiring situation’ soon as well. Hi Binita, you really nailed it with this letter about how unemployment is not a choice, it is so much there and how it affects us. But, you did this with funny bones! Loved the way you narrate! Keep up the good work! The feelings are mutual, looking forward to your posts. Keep writing! I think, you just haven’t found a job that suits for you. I so agree with you, Tikno! Thank you for the letter. Its quite on the mark for me as I am recently unemployed. I have quit my job a couple of weeks ago and I am still scared of going out and meeting people, to explain all the drama behind the choice. What did you do originally? I was working in the development field in Egypt… Does the fear get better? I have gone through periods of unemployment in my own life. The key is not to lose hope. Keep looking. Opportunities will come your way. Remember that any honest work is honorable. Thank you so much for sharing your most kind & encouraging thought. I truly appreciate the gesture. I too hope for opportunities to come my way, meanwhile I’m thankful to God for teaching me the lesson of patience. Unemployment can really test your feelings of self-worth… I’m glad you were brave enough to share that with everybody. I applaude your courage.I have faced unemployment and lost through disability. It is humbling, but it is an opportuniy to see the bigger picture. As I questioned myself I questioned what was meant for my life.Unemployment and disability do not define me. God has shown me that challenges were what made me His servant. I pray that you see no failure or disappointment but opportunity for personal growth. Blessings. Money has been always a matter of concern and of course, it determines the standard of living. Being employed is the right of everyone and it’s not only merely a dream. The lack of employment is one of the major issues in India and when the deserving don’t get employed, the matter obviously needs apex consideration. 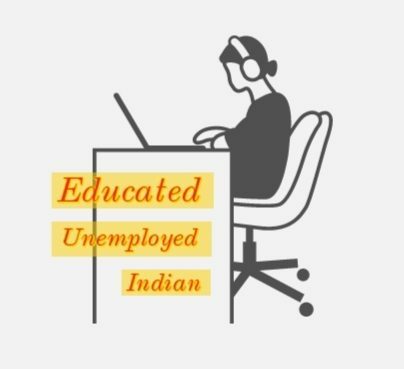 Unemployment is the phenomenon and a problem which is to be understood from different angles and the life of people who are either fully unemployed or partially employed is pathetic. But, reading your blog posts, I know you are a positive minded and have chosen the right path to express your feelings and emotions through blogging, which would otherwise have eaten you up inside. I don’t think you need to search for any jobs, if you are consistent in blogging, it can become your career and lead to a life that you are dreaming for and you are on the right track. Thank you so much Almesh for sharing the wonderful thought. I appreciate it a lot. I completely agree & feel almost exactly the same way to your concerns about unemployment in our country. There are so much talent & skill going to waste because of lack of initiative & consideration on the issue. & to make it even more worse, our education system doesn’t help with this issue in any way possible! Internet has been the one blessing that has helped me & probably so many others like me, to learn to put my skills to use. I’m doing just that right now. Your suggestion to take blogging as career is encouraging. Thanks once again for the words of motivation, made my day! I wish you all the luck in your blogging journey as well. Yes, it is weird:))) But we, artists, are weird. So be proud. and get rid of the idea that you are up to no good. Just the end is enough to melt my heart. I lost my job in end of January so this hits right home thanks for sharing.